Everytime I log in to post something, I desperately wish I had something more eventful to report as far as our adoption goes. Nothing. Going on 3 months since we've been DTV and absolutely nothing has happened. Our monthly update from our agency should be arriving in a few days, maybe they'll have some exciting news. And with Christmas right around the corner, the time is going to fly by and before I know it we're going to be in the #1 spot on the waiting list, right? Right? 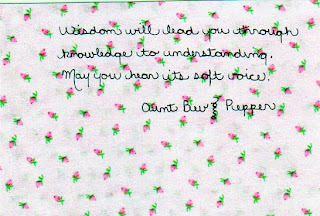 Leaving you with two lovely quilt squares from my Aunt Bev and Pepper. the next month really will fly.